Yokohama (横浜市, Yokohama-shi) is the capital of Kanagawa Prefecture and, with a population of 3.6 million, Japan's largest city after Tokyo, located in the Kantō region of the main island of Honshū. Yokohama is a major commercial hub of the Greater Tokyo Area. Yokohama was a small fishing village until Commodore Matthew Perry and his United States navy ships forced the Japanese shogunate to open some ports to foreign trade. Yokohama was thought to be sufficiently isolated, and the Port of Yokohama was opened on June 2, 1859. The Port of Yokohama quickly became the base for foreign trade in Japan. Many Western influences were first implemented in Yokohama, including Japan's first daily newspaper (1870), gas-powered street lamps (1872), railway (1872), and coal burning power plant (1887). Yokohama was nearly destroyed by the Kanto Earthquake in 1923, and by fire bombing during World War II. Today it is one of Japan’s major ports along with Kobe, Osaka, Nagoya, Hakata, Tokyo, and Chiba. It still boasts a large foreign population, and the largest Chinatown in Japan. Until the end of the feudal Edo period, when Japan held a policy of national seclusion, and had little contact with Western foreigners, Yokohama was a small fishing village. 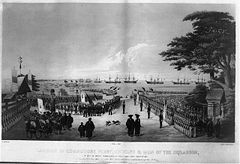 In 1853, and again in 1854, Commodore Matthew Perry arrived just south of Yokohama with a fleet of American warships, demanding that Japan open several ports for commerce, and forced the ruling Tokugawa shogunate to accept. It was initially agreed that one of the ports to be opened to foreign ships would be the bustling town of Kanagawa-juku (in what is now Kanagawa Ward) on the Tōkaidō, a strategic highway which linked Edo to Kyoto and Osaka. However, the Tokugawa shogunate decided that the location of Kanagawa-juku was too close to the Tōkaidō for comfort, and port facilities were built across the inlet in the sleepy fishing village of Yokohama instead. The Port of Yokohama was opened on June 2, 1859. Landing of Commodore Perry, officers & men of the squadron, to meet the Imperial commissioners at Yoku-Hama (Yokohama?) July 14, 1853. Lithograph by Sarony & Co., 1855, after Wilhelm Heine. The Port of Yokohama quickly became the base for foreign trade in Japan. Japan's first English language newspaper, the Japan Herald, was first published in Yokohama in 1861. Foreigners occupied a district of the city called "Kannai" ("inside the barrier"), which was surrounded by a moat, and were protected by their extraterritoriality status both within and outside the moat. Many individuals crossed the moat, causing a number of problems. The Namamugi Incident, one of the events that preceded the downfall of the shogunate, took place in what is now Tsurumi Ward in 1862. Four British subjects were on their way to visit a shrine when they failed to show proper respect to the father of the Daimyo of Satsuma, Shimazu Hisamitsu, as he was passing in the other direction with a thousand-man contingent of guards. The Britons were attacked for disrespecting Shimazu, and one of them was killed. In retaliation, British warships engaged Satsuma a year later in the Anglo-Satsuma War, a naval bombardment of Kagoshima which awoke the samurai of the Choshu region to the urgent need for modernization in Japan. Ernest Satow wrote about the incident in his A Diplomat in Japan. After the Meiji Restoration of 1868, the port of Yokohama was developed for trading silk, with the main trading partner being Great Britain. Many Western influences first reached Japan in Yokohama, including Japan's first daily newspaper (1870) and Japan's first gas-powered street lamps (1872). Japan's first railway was constructed in the same year to connect Yokohama to Shinagawa and Shimbashi in Tokyo. In 1887, a British merchant, Samuel Cocking, built the city's first power plant, a coal burning plant, at first for his own use, but it became the basis for the Yokohama Cooperative Electric Light Company. The city was officially incorporated on April 1, 1889. 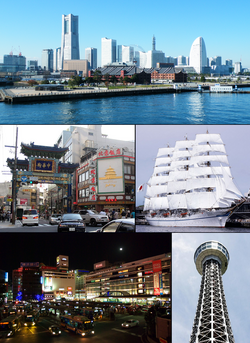 By the time the extraterritoriality of foreigner areas was abolished in 1899, Yokohama was the most international city in Japan, with foreigner areas stretching from Kannai to the Yamate Bluff area and the large Yokohama Chinatown. The early twentieth century was marked by rapid growth of industry. Entrepreneurs built factories along reclaimed land to the north of the city towards Kawasaki, which eventually grew to be the Keihin Industrial Area. The growth of Japanese industry brought affluence to Yokohama, and many wealthy trading families constructed sprawling residences there, while the rapid influx of population from Japan and Korea also led to the formation of Kojiki-Yato, the largest slum in Japan at the time. Much of Yokohama was destroyed on September 1, 1923, by the Great Kantō earthquake, killing an estimated 23,000 people within the city boundaries. In the aftermath of the quake, mass murder of Koreans by vigilante mobs, who blamed them for the earthquake, occurred in the Kojiki-yato slum, fueled by rumors of rebellion and sabotage. Martial law was in place until November 19, 1923. Rubble from the quake was used to reclaim land for parks, the most famous of which is the Yamashita Park on the waterfront which opened in 1930. Yokohama was rebuilt, only to be destroyed again by approximately thirty U.S. air raids during World War II. An estimated 7000-8000 people were killed in a single morning on May 29, 1945, in what is now known as the Great Yokohama Air Raid, when B-29s dropped firebombs over the city and in the space of just 1 hour and 9 minutes reduced 34 percent of the city to rubble. 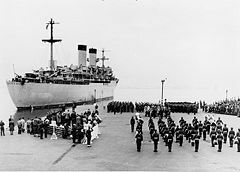 During the American occupation, Yokohama was a major transshipment base for American supplies and personnel, especially during the Korean War. After the occupation, most local U.S. naval activity moved from Yokohama to an American base in neighboring Yokosuka. Construction of Minato Mirai 21 ("Port Future 21"), a major urban development project on reclaimed land, started in 1983. Minato Mirai 21 hosted the Yokohama Exotic Showcase in 1989, which saw the first public operation of Maglev trains in Japan and the opening of CosmoClock 21, at the time the largest ferris wheel in the world. The 860 meter-long Yokohama Bay Bridge was also opened in 1989. In 1993, the Yokohama Landmark Tower, the tallest building in Japan, was opened in Minato Mirai. The 2002 FIFA World Cup final was held in June 2002, at the International Stadium Yokohama. Yokohama is centered on an inlet on the western side of Tokyo Bay, 30 kilometers (18 miles) from Tokyo, to which it is connected by a half-dozen railway lines as well as expressways and surface streets, via the city of Kawasaki. Neighboring cities include Yokosuka , Kamakura, Fujisawa, Zushi, Yamato, and Machida of Tokyo. A major industrial zone known as the Keihin Industrial Area stretches along the reclaimed coastline to the north of the central area towards Kawasaki and Tokyo beyond. The historic port area of Kannai used to be the center of Yokohama, but the area around the transportation hub of Yokohama Station is now the most prominent commercial district. In between is a major harbor-side redevelopment called Minato Mirai 21. Much of the suburban areas are comprised of hills. A major residential development called Kohoku New Town, housing about 300,000, is located 12 km north of the city center. The city has a strong local economic base, especially in the shipping, biotechnology, and semiconductor industries. Nissan plans to move its headquarters to Yokohama from Chūō, Tokyo, by 2010. The Minato Mirai 21 district of Yokohama, featuring the Landmark Tower and surrounding buildings. The places of interest are mainly around the historic port area of Kannai. Next to the waterfront Yamashita Park is Yokohama Marine Tower, the tallest lighthouse in the world. Further inland lies Yokohama Chinatown, the largest Chinatown in Japan and one of the largest in the world. Also in the vicinity is the Yokohama Stadium, the Silk Center, and the Yokohama Doll Museum. There is also a large immigration office, near Yamashita Park. Nearby Isezakicho and Noge areas offer many colorful shops and bars and, with their restaurants and stores catering to residents from China, Thailand, South Korea, and other countries, have an increasingly international flavor. The small but fashionable Motomachi shopping area leads up to Yamate, or "The Bluff" as it used to be known, a pleasant nineteenth/early twentieth-century Westerners' settlement overlooking the harbor, scattered with foreigners' mansions. A foreigners' cemetery and the Harbour View Park is in the area. The Rose Garden can be found in the park. There are various points of interest in the futuristic Minato Mirai 21 harborside redevelopment. The highlights are the Landmark Tower, the tallest building in Japan; Queen's Square Yokohama (a shopping mall) and the Cosmo Clock, which was the largest ferris wheel in the world when it was built in 1989 and which also doubles as "the world's biggest clock." The Shin-Yokohama district, where the Shinkansen station is located, is some distance away from the harbor area, and features the 17,000 capacity Yokohama Arena, the Shin-Yokohama Raumen Museum, and Nissan Stadium, once known as the International Stadium Yokohama when it was the setting for the final for the 2002 FIFA World Cup held on June 30, 2002. The city is also home to the Central League baseball team, the Yokohama BayStars, and the soccer teams, Yokohama F Marinos and Yokohama FC. The Yokohama Municipal Assembly consists of 92 members elected from 18 Wards. The LDP has minority control with 30 seats with Democratic Party of Japan with a close 29. Public elementary and middle schools are operated by the city of Yokohama. 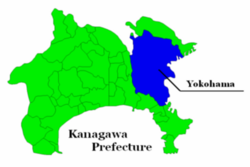 Public high schools are operated by the Kanagawa Prefectural Board of Education. ↑ Yokohama City, Kouhoku New Town. Retrieved December 18, 2007. ↑ Yokohama City, Yokohama Doll Museum. Retrieved December 18, 2007. ↑ Yokohama City, 8 CIties/6 Ports. Retrieved December 18, 2007. Yokohama Historical Property Inspection Committee. 2002. City Memories: Important Historical Structures in Yokohama. Yokohama: Yokohama Historical Property Inspection Committee. Yokohama Visitors' Guide—Upcoming events and announcements, by the Yokohama Conventions & Visitors Bureau. Yokohama guide in Pictures ( Minato Mirai, Chinatown, Yamashita park, Sakuragicho, Stadium, Cosmo World). This page was last modified on 29 July 2013, at 14:02.